The 2018 Reebok CrossFit Games teams were stronger and more competitive than ever before! This year we saw all top three teams on the podium from the United States of America. Here’s a little about the first, second and third 2018 CrossFit Games Fittest Teams on Earth. CrossFit Mayhem Freedom rose to stardom after four time CrossFit Games Individual champion Rich Froning, (owner of CrossFit Mayhem), retired from individual competition and joined his Mayhem team. They won back-to-back 2015 and 2016 CrossFit Games Fittest Team on Earth, and then took second place at the 2017 CrossFit Games. 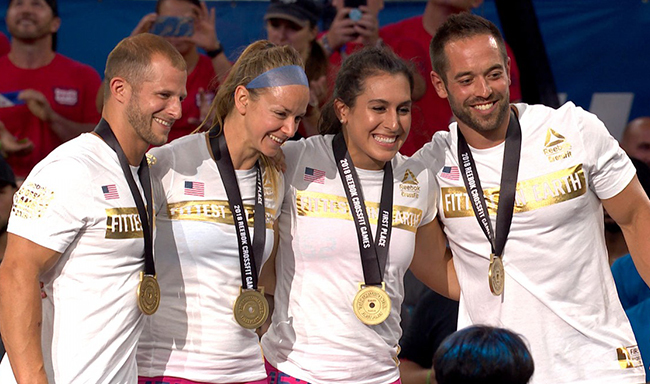 This will be their third championship win as the Fittest Team on Earth. They pushed hard all weekend to win that gold medal back, taking three event wins in the Bicopulet Relay, Team Battleground and Bike Deadlift and took 11 top 10 finishes. The team consists of Richard Froning Jr., Lindy Barber, Matt Hewett and Tasia Percevecz. It was apparent that CrossFit Invictus X Legacy Team worked hard all year to prepare mentally and physically for the 2018 CrossFit Games. This year was extra special for Team Invictus as it was their TENTH consecutive appearance at the CrossFit Games. And boy oh boy were they looking for blood! They started strong and finished strong, taking one event win in the Lunging Worm, and 8 top 10 finishes. They were crowned as the Second Fittest Team on Earth at the 2018 Reebok CrossFit Games. The team consists of Sam Dancer, Kaitlyn Kassis, Jennifer Nobis-Dancer and Holden Rethwill. This is Team OC3’s third consecutive year at the CrossFit Games, and their first podium appearance. They were consistent all weekend, with 9 top 10 finishes. Their hard work paid off and they were crowned as the Third Fittest Team on Earth at the 2018 Reebok CrossFit Games. The team consists of Colin Cartee, Taylor Williamson, Andrea Elizabeth Nisler and Joe Piersanti. Congratulations to all 40 teams that competed and gave it their all. You should be super proud of your accomplishments and all your hard work and efforts. We look forward to you coming back stronger than ever before in the 2019 CrossFit Games season.